Elevators are a great opportunity to advertise, whether in an office building, airport, medical facility, or any public building that sees a lot of foot traffic. 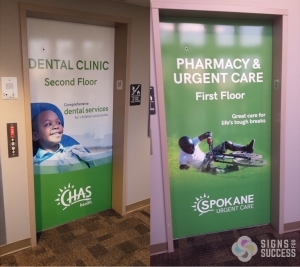 The elevator door wraps for CHAS Health are used to advertise individual offices and as wayfinding to direct people to the correct floor. Elevator wraps also work as environmental graphics, beautifying an ordinary element in the environment. Environmental graphics improve an environment visually by adding graphics or artwork that enhances a patron’s experience. It can serve an additional purpose, such as advertising or wayfinding, but it always does this in a way that enhances the space visually. 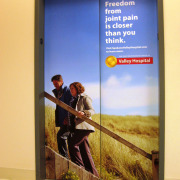 These elevator door wraps enhance plain elevator doors with colorful graphics and useful information. You can use elevator door space to advertise a product or business. Add eye catching graphics right where people are looking and have time to observe. It also offers an opportunity to recognize donors and sponsors or promote donor opportunities. Or, simply display a welcoming message to give a positive impression and reinforce branding. Wayfinding is especially useful in large office buildings or medical centers. Graphics can direct people to the specific offices. You also have the opportunity for a directory or map on or near elevator doors to guide patrons where they need to go. Whether you want to add visual interest, advertise or direct, elevator door wraps will enhance your space. At Signs for Success, we work with your vision and budget to create custom sign solutions that work for you! Signs for Success is a locally owned family business in Spokane. We strive for excellent customer service, perfect color, and quick turnaround on every project. Our large production facility allows us to design, print and install everything in-house. Get quality service and quick turnaround on elevator door wraps; contact us for a free quote today!